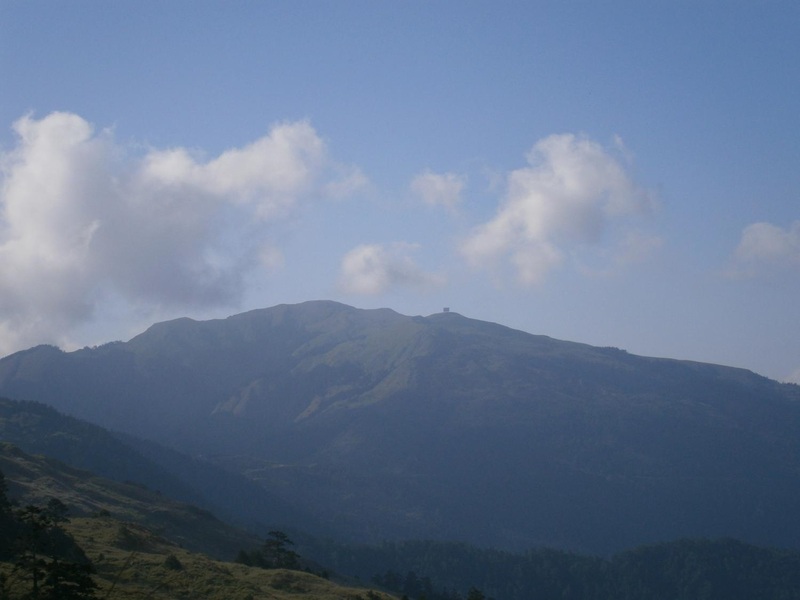 The North peak of Chilai Shan, as viewed from across the valley. 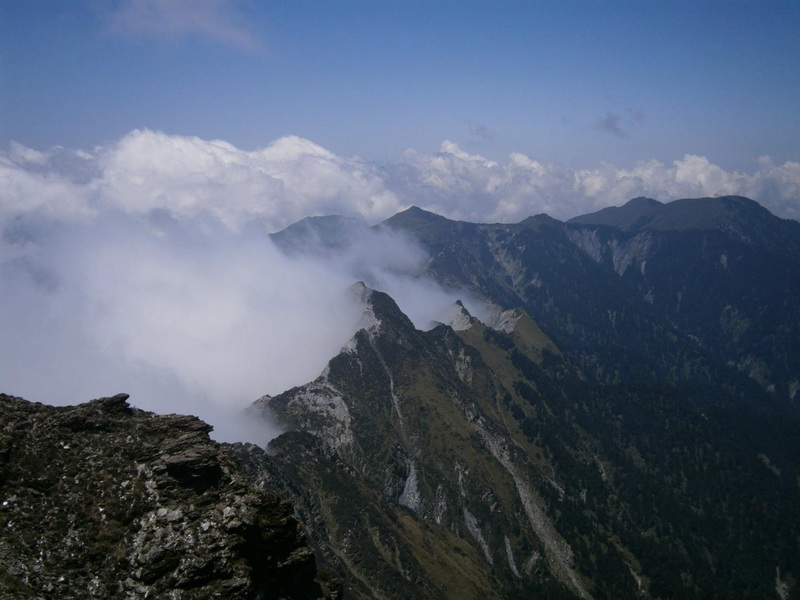 I took this photo the week prior, while hiking the north-west ridge of Hehuan Shan. 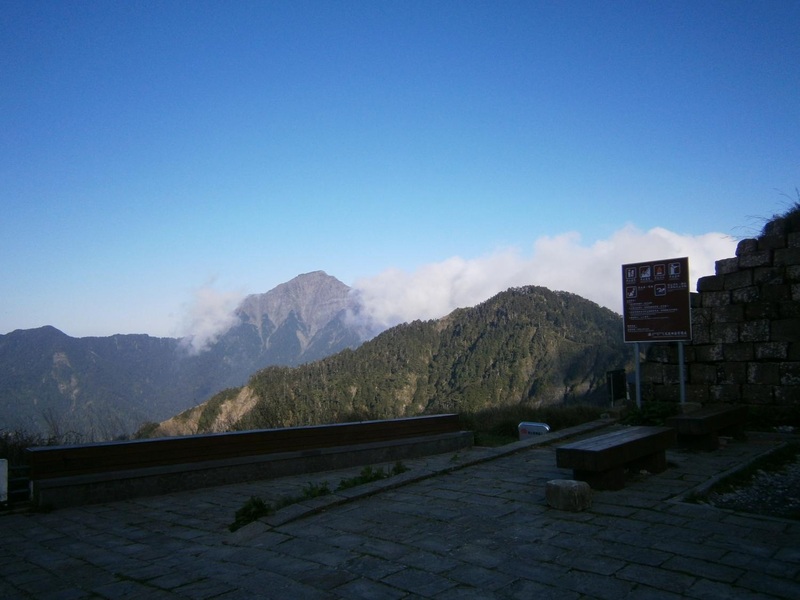 Chilai Shan (奇萊山), commonly referred to as “Black Chilai”, is one of Taiwan’s better known 3000+ meter mountains. Its fame is largely due to the accidents it has been host to. 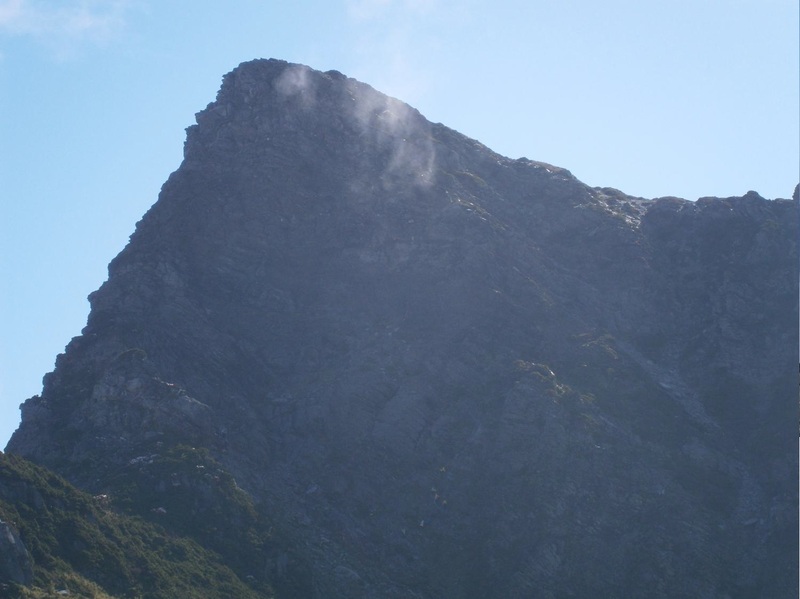 The “Black Chilai” name plays reference to the shiny black rock which forms the face of the imposing North Peak, as well as the unlucky reputation the mountain has. The ridge we would hike. 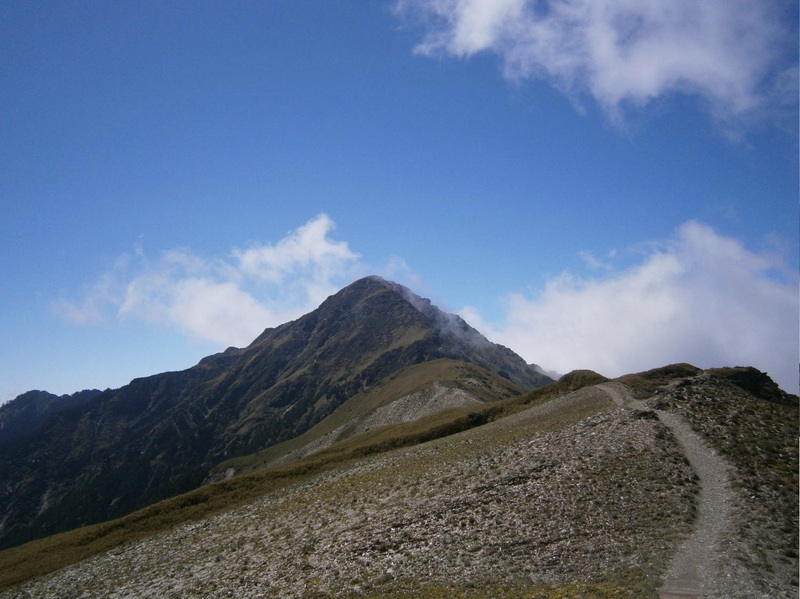 Chilai’s north peak (3607m) to the left, main peak (3560m) to the right. 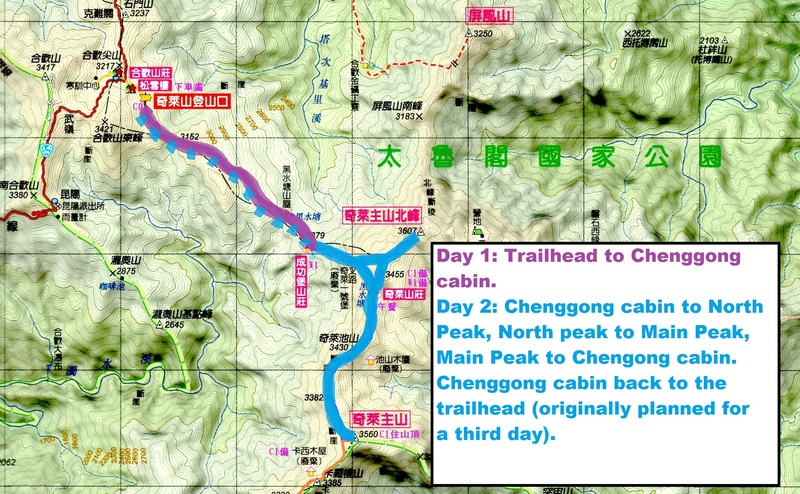 Our two day hiking route. The trail to Chenggong cabin. A downhill route descending into the valley between the Hehuan and Chilai mountains. Day 1: Our trip began with a 7:00 a.m. bus from Taipei to Puli, arriving around 11 a.m. We rented a scooter in Puli and drove 2 hours, through light rain showers, to the trailhead. From there a two and a half hour hike, mostly downhill through alpine meadows and thin patches of forest, took us to the Chenggong cabin, where we would spend the night. The weather wasn’t promising; the sky opened up and rained heavily on the way to Chenggong, and we arrived with our raingear dripping wet. Day 2: Our plan was to wake up at 4 a.m. and begin as the sun rose, but a large Taiwanese group sharing the cabin with us got up at 2:45. They were noisy, so rather than try to sleep we got up as well. 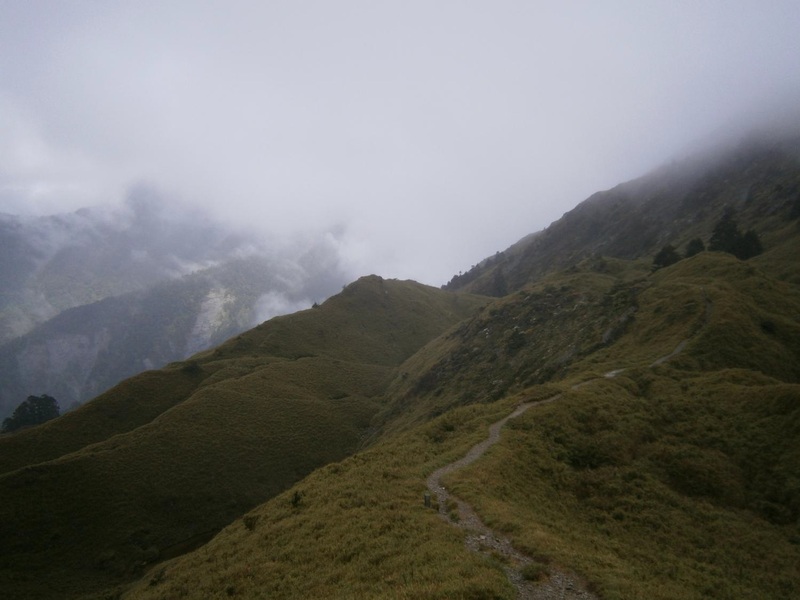 We began hiking up towards the Chilai ridge, through thick clouds and strong wind, at around 4 a.m. It was startlingly cold for the spring. The route up to the ridge was exposed and very windy, but granted us occasional glimpses of blue sky as thick clouds billowed past us. 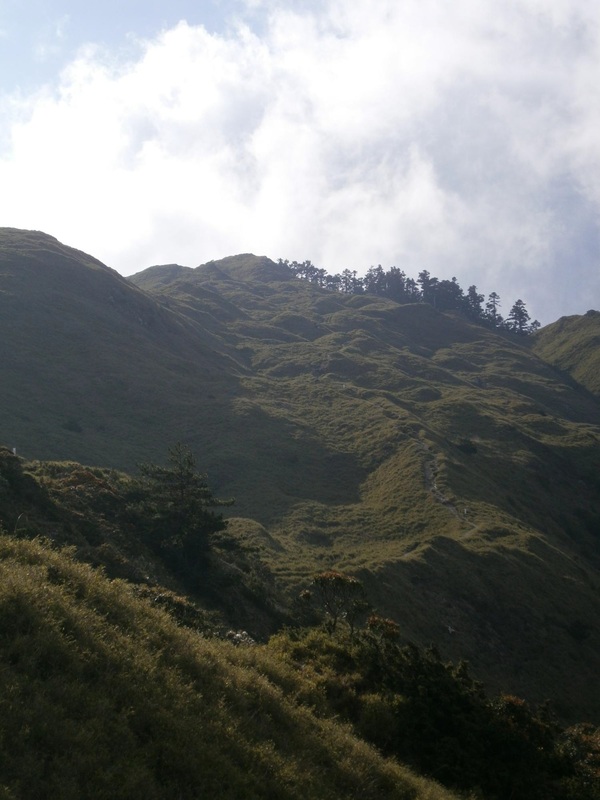 From the ridge, we turned left towards the North Peak of Chilai. 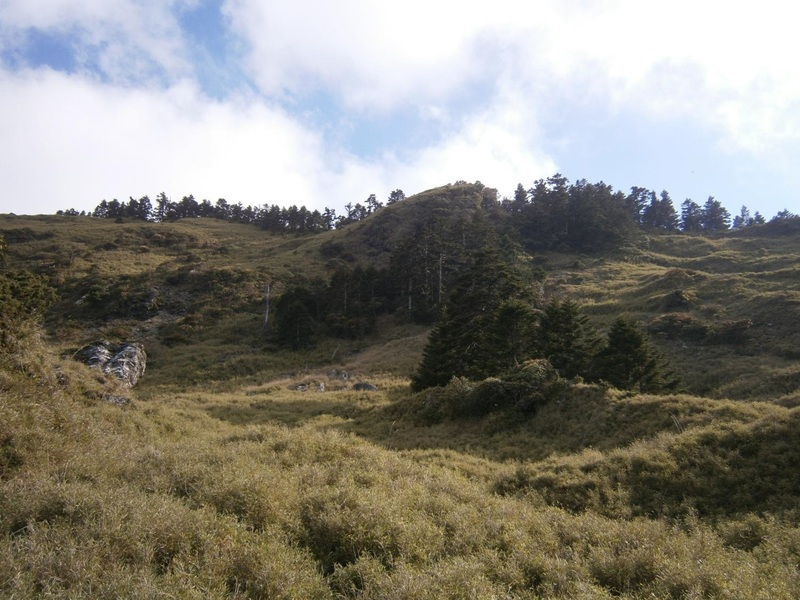 The trail evened off considerably, and took us across nearly level alpine meadow, studded with rhododendrons in bloom, to the base of the North Peak, a pyramid of black rock. 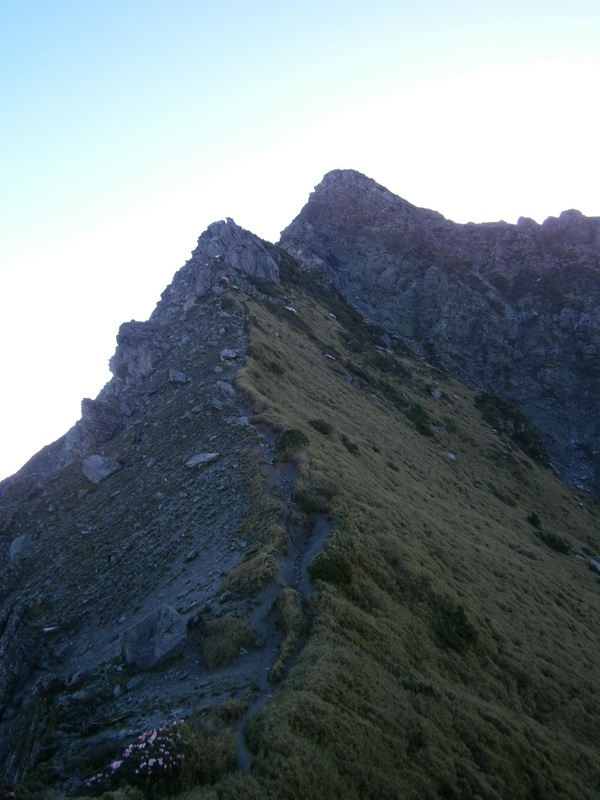 The path up at the start of the North Peak. From the base of the North Peak the trail became steeper and entertaining, with fixed ropes taking us up the sharp face. At this point the wind had become quite strong and our hands, gloves wet from the ropes, were cold – a real surprise for spring weather. Headed up the north peak. 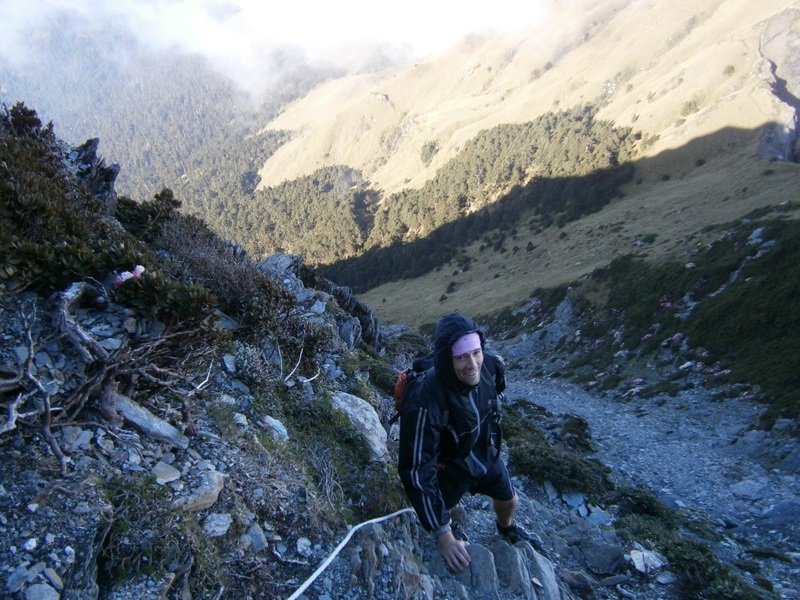 We reached the top of the Chilai North Peak (3607m) at around 6:45. 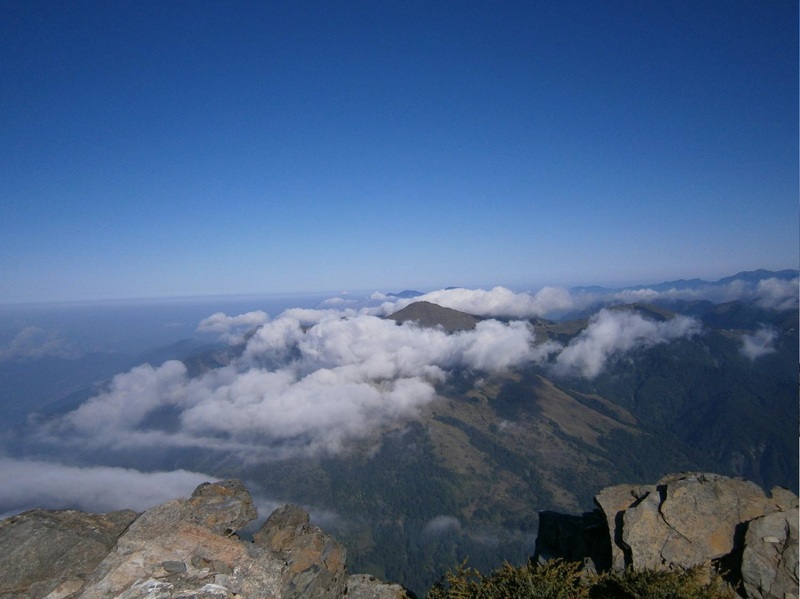 On the way up the clouds settled, the sun came out, and the weather became clear and glorious, revealing awesome views of Chilai Main Peak, the Chilai ridge, and the nearby Hehuan mountains. On top of the north peak. Still surprisingly cold. 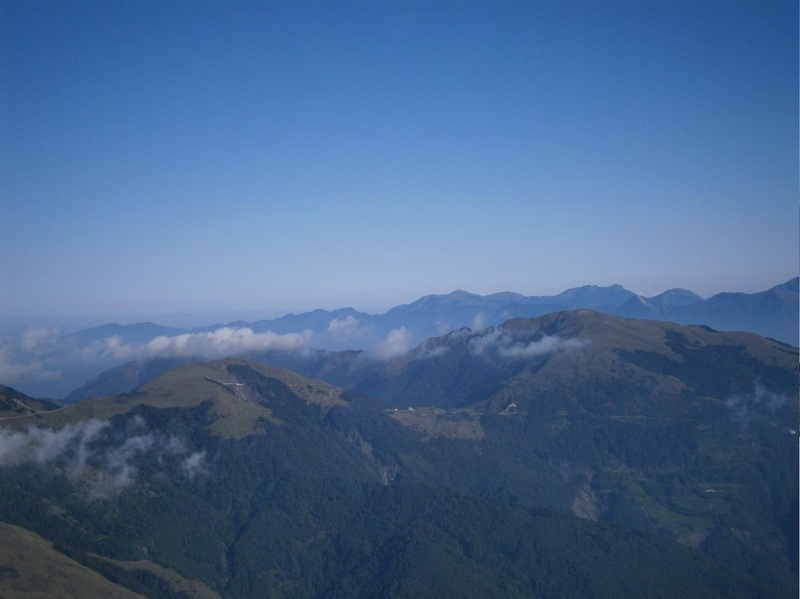 Part of the Hehuan mountains, where I was hiking the weekend prior to this trip. The trail far below us. In this photo, the Taiwanese team is approaching. Look carefully between the patch of trees and the cliff. Their leader is wearing a red jacket. We stayed on top for around half an hour, taking photographs and enjoying the amazing views. 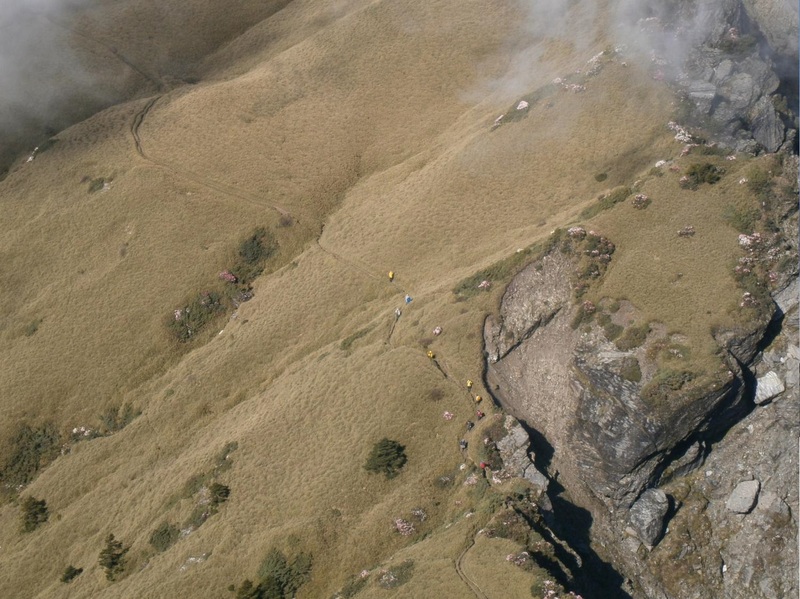 Below, we eventually saw the large Taiwanese team approaching across the ridge, their tiny forms giving scale to the impressive scenery laid in front of us. Zoomed in, the approaching Taiwanese team is easier to see. 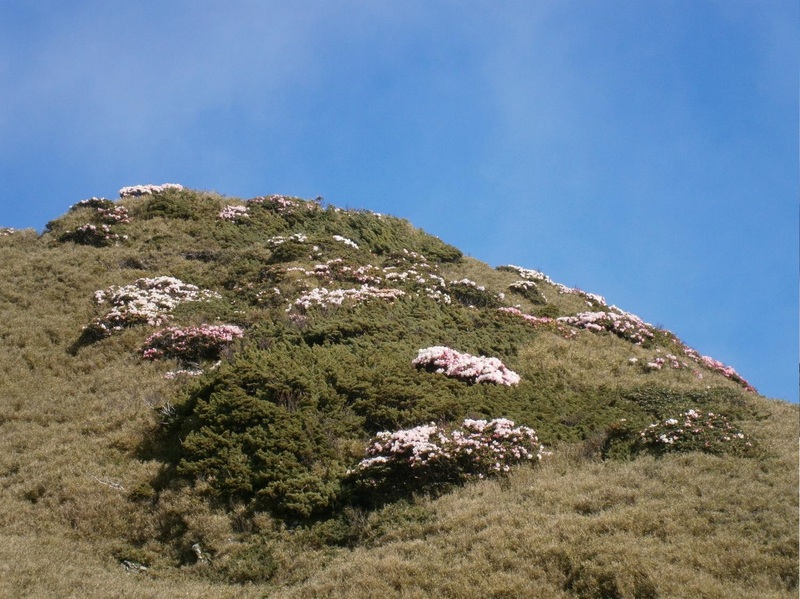 You can spot rhododendron bushes in full bloom along the ridge to the right. The North Peak loomed behind us as we headed back across the ridge. The Taiwanese team is headed up. Look in the middle of the photo, near the bottom. After descending the North Peak we hiked across the ridge, stopping for lunch at the very primitive Chilai cabin and passing several interesting areas of barren grey rock. The very rough (and leaky) Chilai cabin, where we stopped for lunch. The main peak of Chilai in the distance. 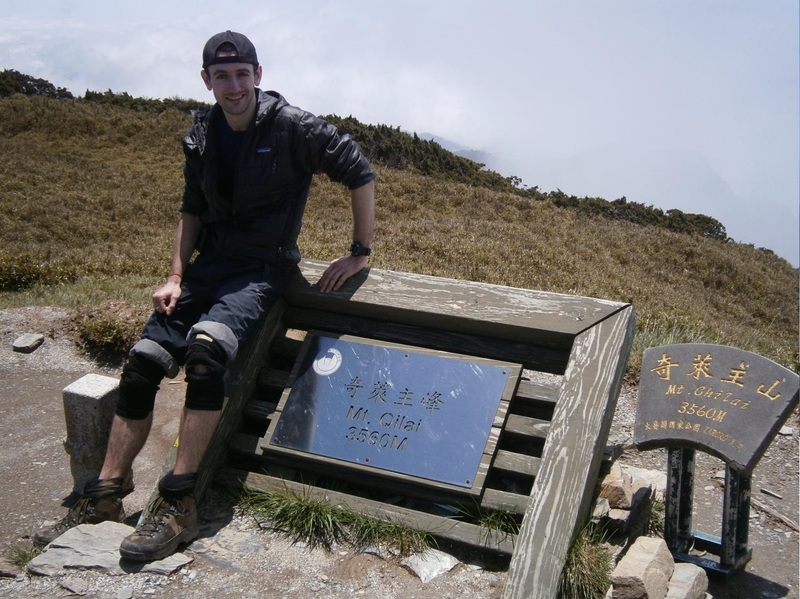 We arrived at the Chilai Main Peak (3560m) at around 11 a.m. The views from the Main Peak perfectly complemented the North Peak’s scenery; we could see the North Peak we’d come from several hours earlier, and had impressive views of the valley and South Chilai ridge. 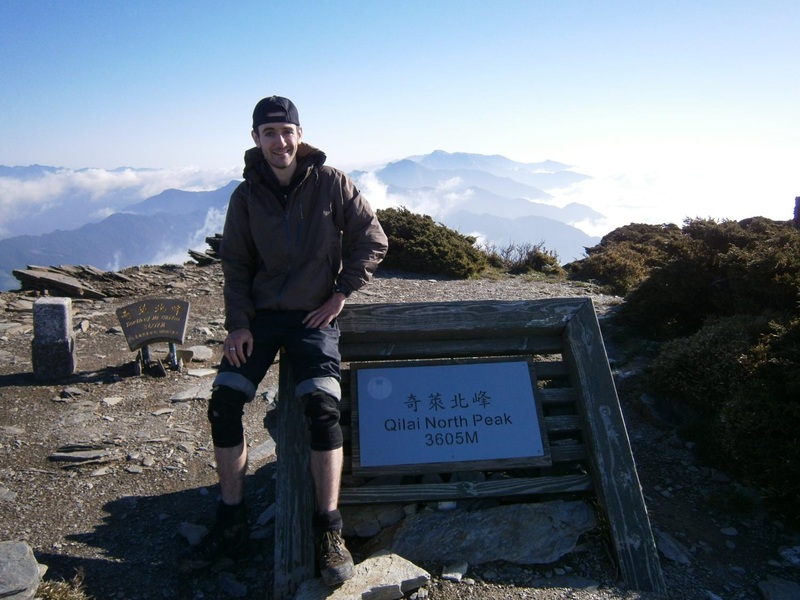 Descending the Main Peak, we arrived back at Chenggong cabin around 2:40 p.m.
We had a great view of the Chilai ridge from the Main Peak. 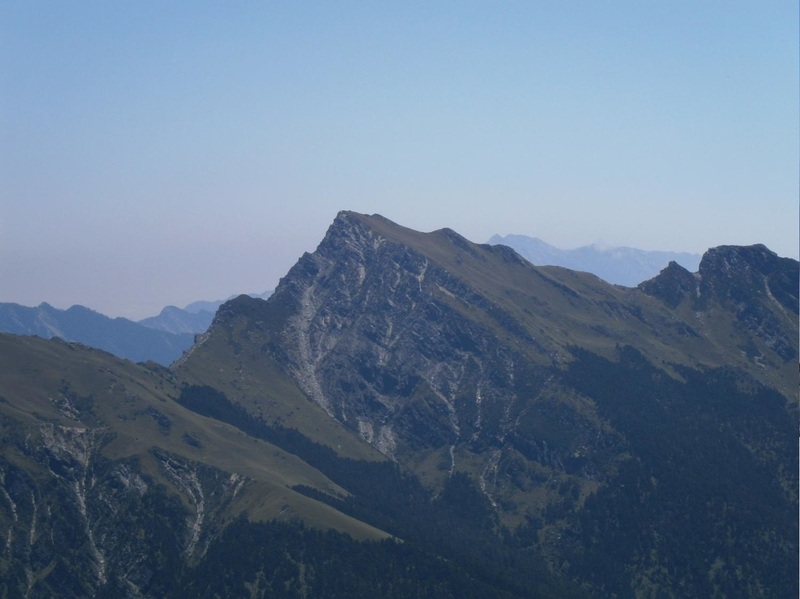 With no cloud cover, you can see the entire route that we took from the distant North Peak (to the right). The North Peak looked impressive in the distance. 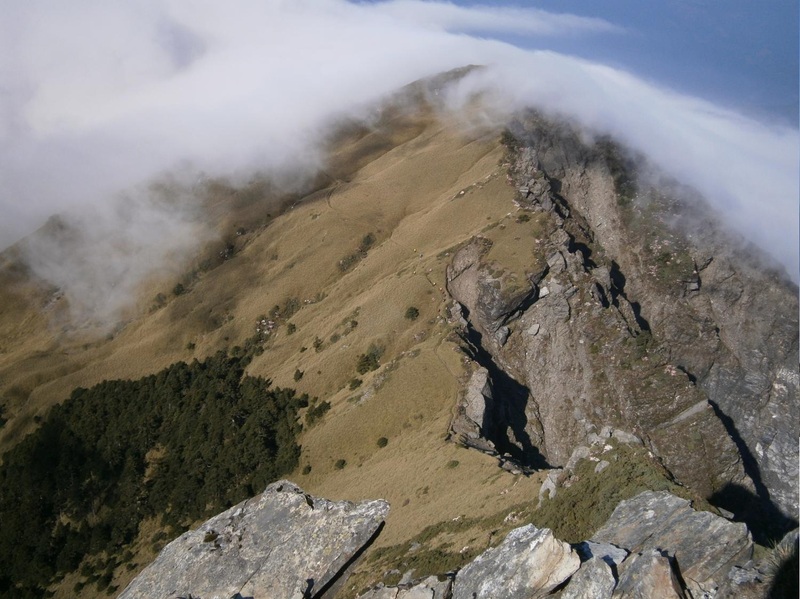 The south ridge looked amazing, with clouds billowing up its side. 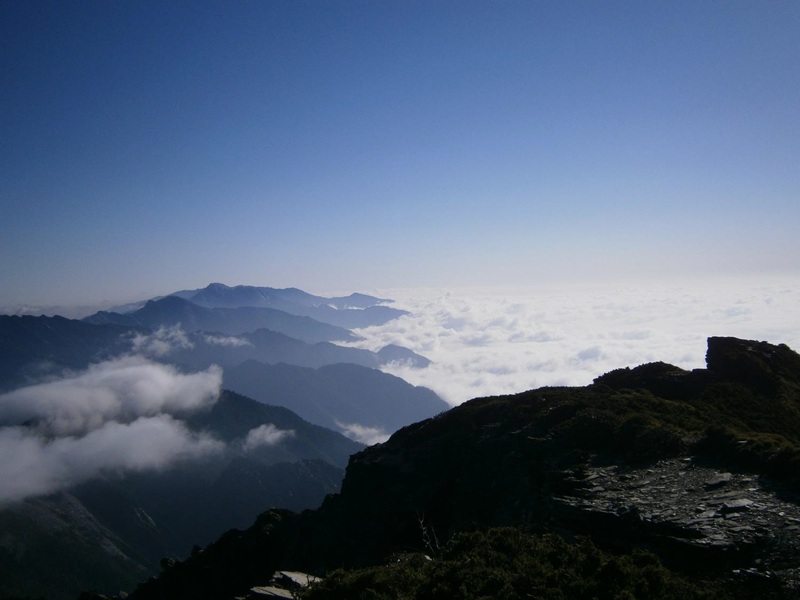 The North Peak of Hehuanshan in the distance. The big aircraft reflector makes it easy to spot. Originally, the plan was to make this a three-day trip, with a second overnight at Chenggong. However, with such awesome weather, and making good time, we decided to return home rather than share the cabin another night. We packed up quickly and left the cabin at 3:20. With my friend’s speed a good motivator for my own, slightly slower pace, we covered the 4.8km of uphill terrain at a good clip and got back to the trailhead at 5:00 p.m.. From the trailhead, we drove back to Puli, and got a bus back to Taipei where we arrived at 11:30 p.m.
Part of the route back to the trailhead. 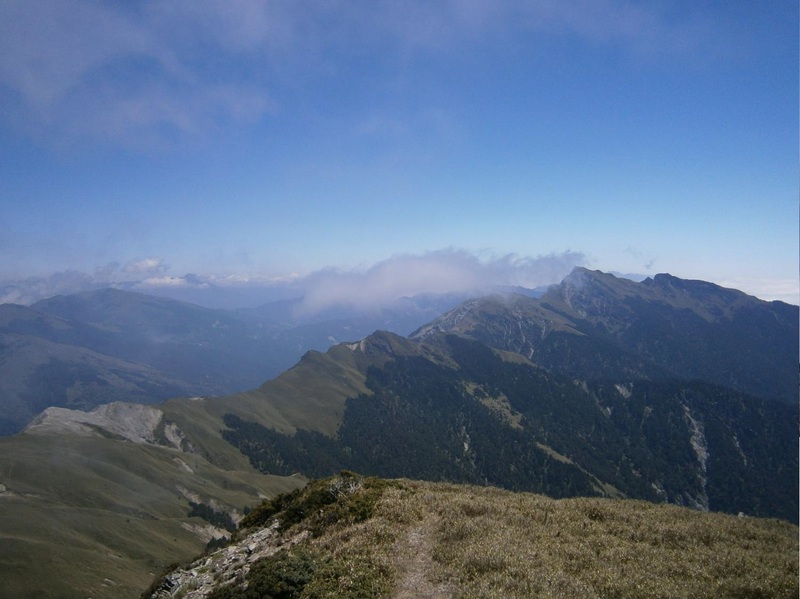 Mostly uphill, through gorgeous meadows and intermittent forest. With the sun out, it was really hot! The meadows looked pristine in the sun. The trailhead, with the north peak in the distance. The Chenggong cabin was very comfortable, albeit a little noisy to share. There are several spots where one could camp up on the ridge, and one or two spots nearby the cabin. The cabin is positioned right beside a stream, making for an easy water source. The Chilai trailhead is easy to access. Buses run from Taipei to nearby Puli (3-4 hours), from where one can drive to the trail-head in around 2 hours. There are plenty of motorbike rental shops in Puli, although they may require a local driver’s license. 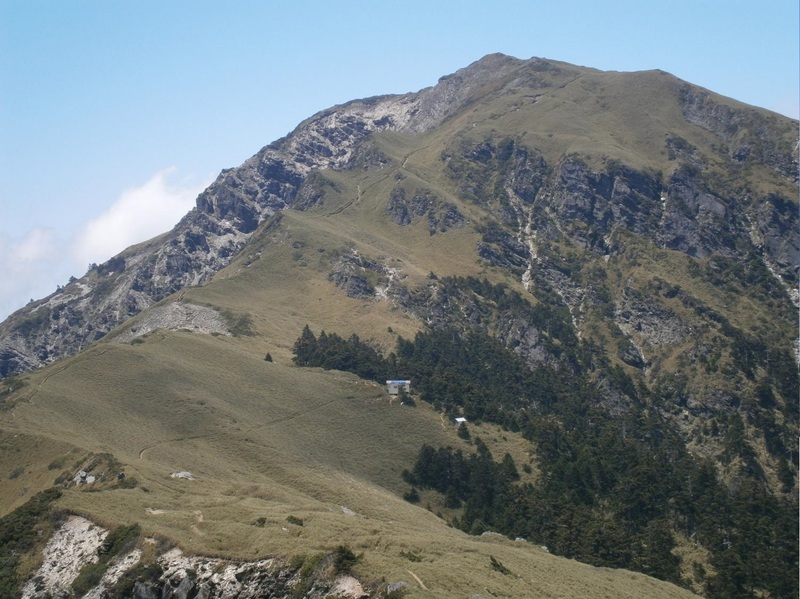 This entry was posted in Hiking, Taiwan - 台灣, Taroko National Park - 太魯閣國家公園 and tagged Chilai Shan, Taiwan Hiking, Taroko National Park, 太魯閣國家公園, 奇萊山 by Ian. Bookmark the permalink. Thanks for your post and awesome photos! 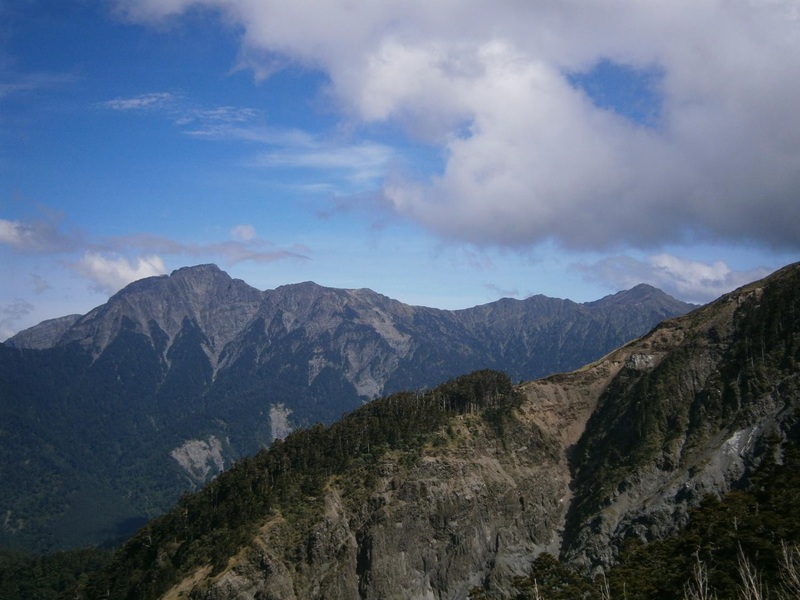 Do the authorities ever give you any trouble if your Taiwanese friend does not make it to the hike? I mean, do they still let you hike if the group leader is absent? Also, how strict are they on enforcing the gear list? Hello Eliza! Glad you found it useful. 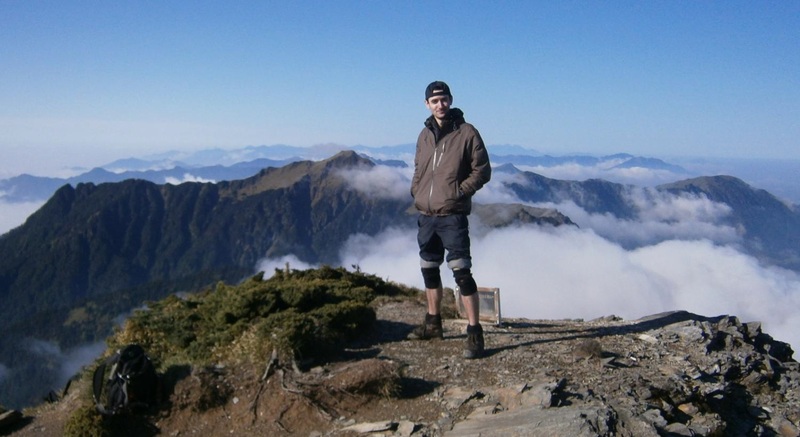 I haven’t hiked in Taiwan in over five years now; I can’t comment on the present situation with permitting there. 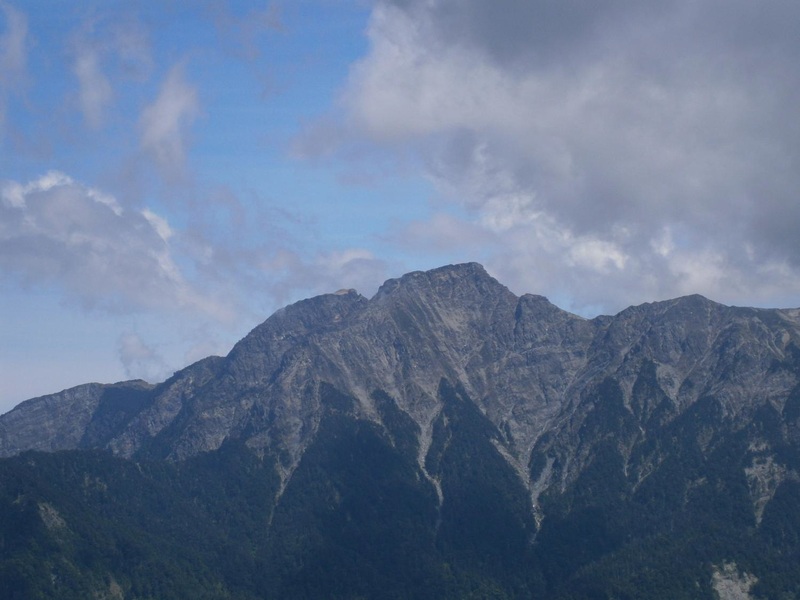 I’d strongly suggest you connect with other hikers via the ‘523 Mountaineering Association’ Facebook group.